Can you believe Valentine’s Day is just a little while from now! 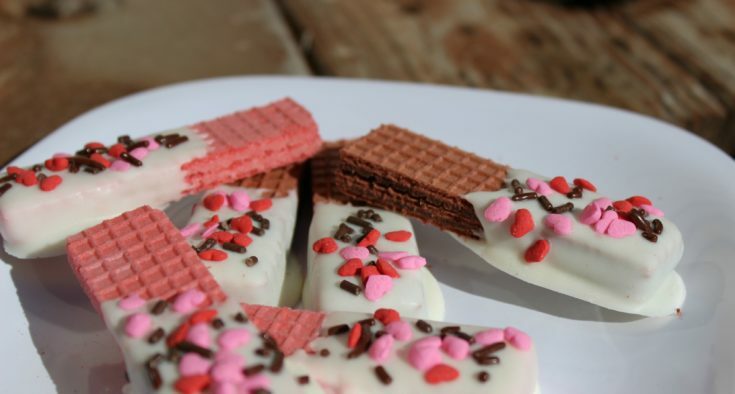 I thought I would share a really easy No-Bake Valentine’s Day Dipped Wafer Cookies. Just 3 Ingredients, and they are very affordable to make! 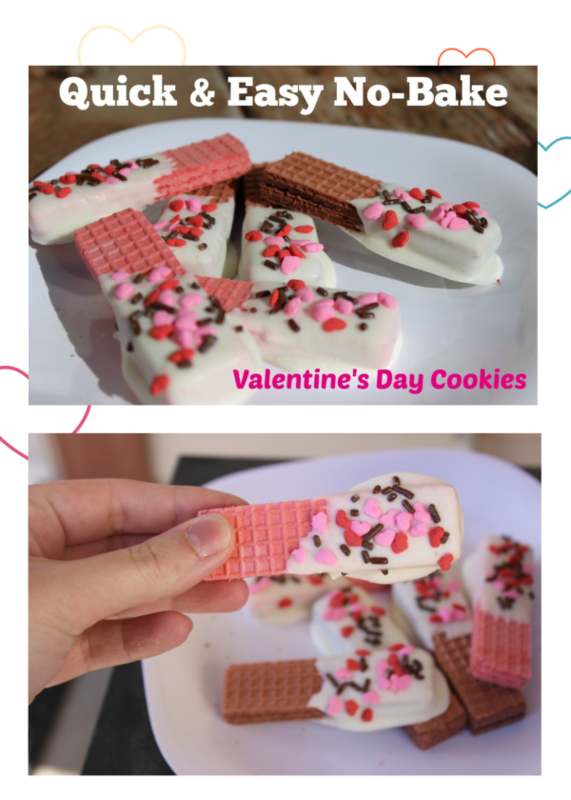 These would be fun for school Valentine’s Day parties, treats for after school, or gifts for friends and neighbors. Or if you are like me, enjoy a few of them for yourself! 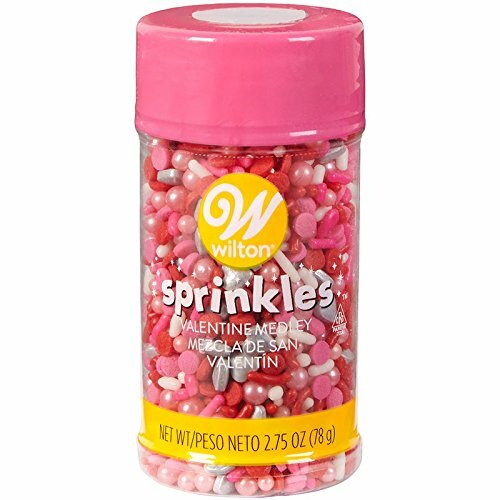 They are fun to make and you can go crazy if you want and get a bunch of different sprinkles to use, and you can choose any wafers you want. I picked the chocolate and strawberry ones to make it more Valentine’s Day inspired! Really it isn’t a recipe at all, but hey, it is a fun idea and I thought I would share it with you guys! More of like an inspirational idea with a guide on how to make them! 1. First off melt your chocolate. I prefer almond bark because it hardens up really nicely. If you use white chocolate chips you will have to add shortening in it, so that it hardens after awhile. 2. Next take your wafer and dip half the cookie into the white chocolate. 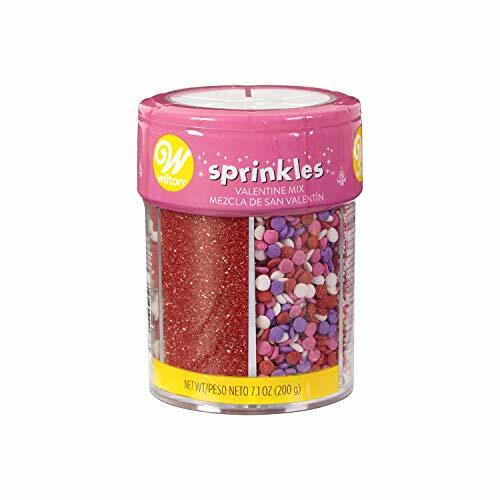 Then lay on wax paper and immediately sprinkle some of your sprinkles on top. If you wait the chocolate will harden and sprinkles won’t stick. That is it, serve and enjoy! You can also put these in a fun tin, or wrap in a treat bag to make these look fun to give as a gift! Enjoy! Do these look like a tasty treat you would enjoy?! These yummy cookies are easy to make with just 3 ingredients. It's a fun treat-making process even the kids can enjoy! Melt your chocolate in microwave. Cook for 20 seconds at a time, stirring after each 20 seconds, until melted. 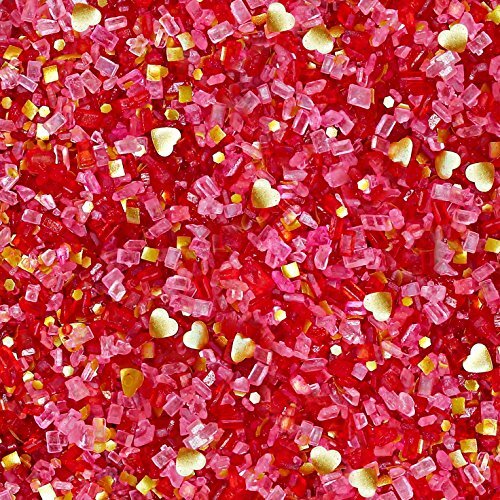 Lay on wax paper and immediately sprinkle sprinkles on top. You had me at no-bake. I am ALL FOR anything that is as awesome as this AND saves me time. Sugar wafers dipped in chocolate and covered in sprinkles? BOOM! That’s amazing. This is so simple, yet genius. My husband would love these. What a cute dessert idea! I love adding chocolate to treats like these. I love wafers! What a great idea to just dip them! Awwww, those look so cute and delicious. I love wafer cookies. So I will definitely be making these. No-bake recipes are great! And these are super cute! 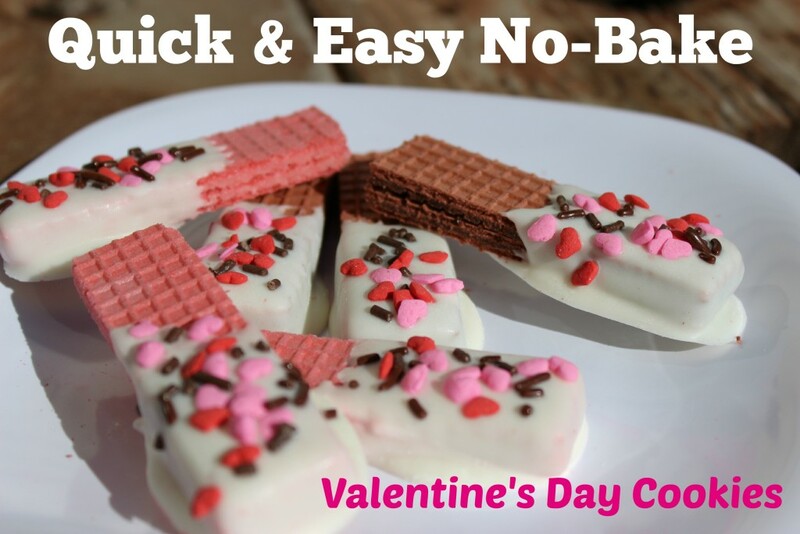 I will have to make them for a Valentine’s Day snack for my kids. That is such an awesomely easy and yummy recipe! I love those cookies. These look like a delicious no bake treat. I will have to try making some this weekend. These look delicious. What a great treat to make for classroom parties or parties. These are so cute and my kids LOVE those wafers! What a perfect treat! I love wafers! I’ll definitely have to try this out! I love how easy this looks to make! Also, how inexpensive! 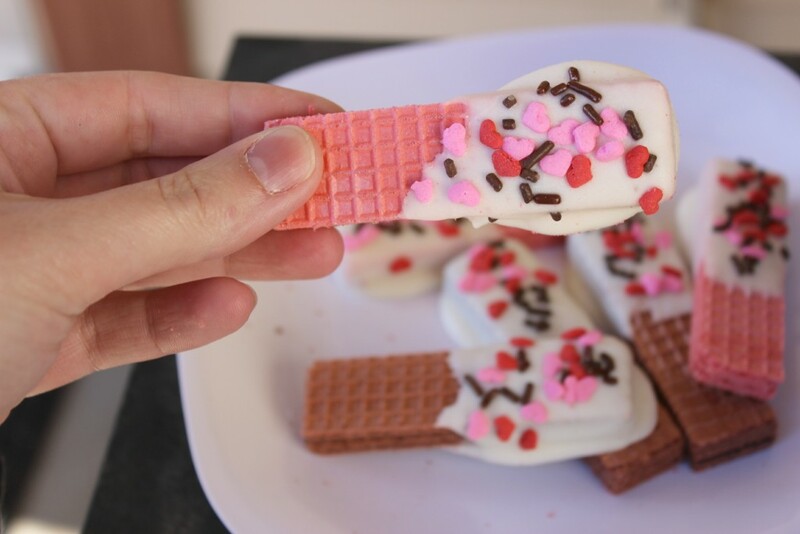 These are so cute…..and I have always loved wafer cookies! My kids would absolutely love this treat. So easy and cute! Cute and the perfect snack for the kids to help make! These are a great idea. My kids love those wafer cookies. Heck yeah, those look like a treat I’d eat. Many, many, many of them!